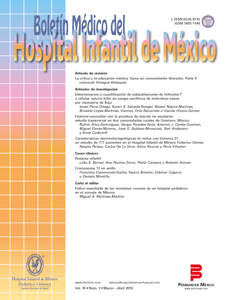 El Boletín Médico del Hospital Infantil de México is a bimonthly publication edited by the Hospital Infantil de México Federico Gómez. It receives unpublished manuscripts, in English or Spanish, relating to paediatrics in the following areas: biomedicine, clinical, public health, clinical epidemiology, health education and clinical ethics. Articles can be original research articles, in-depth or systematic reviews, clinical cases, clinical-pathological cases, articles about public health, letters to the editor or editorials (by invitation).